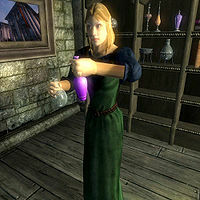 Ardaline, an Altmer alchemist, is an Evoker of the Mages Guild who offers bartering services and advanced Alchemy training at the local Bravil Guild Hall. During the Recommendation quest, you will have to recover her Mage's Staff, which was stolen by a desperate admirer. She seems to enjoy her job and definitely works very hard: starting every morning at 9am she begins mixing up potions using her mortar & pestle, taking a two-hour lunch break at 1pm. At 8pm she stops and eats dinner for two hours in the first floor dining room. After eating, she wanders around the Guild until 1am, when she calls it a day and sleeps in her bed on the second floor for eight hours. She has a Mercantile skill of 40 and 800 gold. She will buy ingredients, potions, alchemical apparatus, and miscellaneous items from you, but only sells magical supplies. She will offer both her training and her bartering services at all times except when eating or sleeping. She wears middle-class attire consisting of a blue & green outfit and a pair of quilted shoes. She also carries a small amount of gold, her mortar & pestle, an empty grand soul gem, and her books: a copy of the standard text Fundaments of Alchemy and the rare tome Children of the Sky. She doesn't wield any weapons, relying instead on a set of leveled alchemist spells. When you approach her for the first time, she will give you a quick presentation: "I'm Ardaline. I'm the guild's Advanced Trainer in Alchemy here in Bravil." She will also give you a few clues about her social life: "I'm afraid I'm not very social. So I really don't know very much about the people here." and "I don't like talking to people much, but Kud-Ei's helping me get over that. That's why she put me in charge of selling alchemy supplies." She will also direct you to Sinderion if you present her with a Nirnroot sample: "Yes. I've seen them before. Don't really know anything about them, as I don't specialize in plant samples. However, I know someone who does. If you make your way to Skingrad, look up Sinderion. He's one of the foremost authorities on the alchemical properties of plants." As an advanced Alchemy trainer, she can provide you with the reference needed to initiate the Alchemy Master Training quest. Speak to her when your Alchemy skill is 70 or above, choose the training option, which will trigger the quest and this dialogue: "If you're looking for further training in Alchemy, I suggest you speak with Sinderion. He's quite gifted, although slightly eccentric. I believe he's working at the West Weald Inn, over in Skingrad. I think Erina tries to keep him out of sight." The townsfolk of Bravil will often discuss her alchemic skills: "Have you heard what a good alchemist Ardaline is? ", "Have you ever bought a potion from Ardaline? ", "Ardaline makes excellent potions. I imagine she would, since she teaches Alchemy at the Mages Guild." and "She's an excellent alchemist. I understand she teaches the trade for Mages Guild members." are four rumors around Bravil, but her fame runs further afield. S'drassa will tell you that "I am the best alchemist in Leyawiin. But if you need Advanced Training, you'll need Brotch Calus in Bruma or Ardaline in Bravil." They also know Ardaline is the object of Varon Vamori's affections and will comment "Seems to me that Ardaline has an admirer in Varon Vamori" or "Something strange is going on with Ardaline and Varon Vamori. I always see him hanging around her", but don't seem to approve, as they will also say "It seems a bit odd. I don't know how Ardaline feels about it." Dedicated guild head Kud-Ei will, as part of the recommendation quest, tell you just how serious the problem is: "I'm very preoccupied with this situation concerning Ardaline. Perhaps you can help with that, however. I can't directly get involved, for fear of embarrassing the poor girl. I'll need you to have a little chat with Varon Vamori, and you can learn something about the power of Illusion in the process." When asked about Ardaline, Kud-Ei will say: "Don't say anything to her. I don't want to embarrass her further. Once this is all taken care of, I'll speak to her privately." Kud-Ei will also offer her own take on Varon’s behavior: "I don't understand it. Some ridiculous male thing, I suppose. He's been bothering Ardaline every day for a while now. He even stole her Mages' Staff! Perhaps he thinks it's amusing; I don't know. But it needs to stop. It's making her miserable." Other members of the Guild have noticed Ardaline behavior change due to her stalker: Delphine Jend will say: "She hasn't been focused on her work recently. It's annoying, frankly." while Aryarie is a bit more concerned: "The girl hasn't seemed herself lately. I have no idea what's wrong, but something's really bothering her." Ardaline herself will refuse to discuss her admirer: "What? I... I don't know anything about him. I'm sorry. Excuse me." When confronted, Varon Vamori will confess: "I don't know what to say. All I want is for her to care about me, to feel the same way as I do about her. But she doesn't. I try and I try, and it just doesn't matter. It makes me furious sometimes!" and will then tell you about her staff: "All right, I admit it. I took it from her. I... I don't know what I was thinking, honestly. I was trying to tell her how I feel.... again... and she wouldn't even stop to talk to me. I just got so angry! I was a little ashamed afterwards, but didn't know how to apologize or give it back." He will finish with "Tell Ardaline I'm sorry." and will also ensure you: "I've never laid a hand on her. Either in anger or... I've never hurt her, okay?" After the staff is returned to its rightful owner, Bravil citizens will commend Kud-Ei for her actions: "Kud-Ei will do anything to help her girls out. She recently got Ardaline out of a bind, and I hear it wasn't completely within guild rules." Bravil Recommendation: Recover a fellow mage's staff to obtain a recommendation from Bravil. Seeking Your Roots: After discovering a peculiar plant called Nirnroot, you decide to investigate it further. Alchemy Training: Persuade a Master Alchemist to instruct you further. Esta página foi modificada pela última vez à(s) 05h15min de 20 de outubro de 2015.